View More In Flip Cases - Page 2. LAMEEKU WALLET CASE with Card Holder give you the simplest life. Did you still confused your heavy purse? Did you still worry about forget to carry the cards? You only need a LAMEEKU WALLET CASE.In the back of case has a pocket that made of 3 separated compartment special for 4+ Cards,ID,Credit cards,or cash.We use unique hidden design,you don't have to worry about the card is exposed or fall out.They will be very secure. To ensure that each case is in good condition and each buttons can be sensitive to use,each leather case we use iPhone 7 PLUS or 8 Plus to test. *100% fit for Apple iPhone 7 PLUS/8 Plus 5.5". *Card holder: 3 hidden card slot securely hold the cards coins cashes, easy to take out your cards. (IDs, credit card or debit cards, or cash folded in three). *Shockproof and Full-frame protection: Protection extends to inside of the case and outer bumper,both of which provide shock-absorption.The front edges extend outward enough to keep your phone's display from making contact with the ground. *Easily acceses:The covered raised buttons and cut-out for the speakers, ports, back camera and mute button are perfectly fit the iPhone. *Leather case: made from soft and durable leather+TPU base shell,soft leather texture,making it comfortable to the touch and a pleasure to look at. It also will add thickness according to the numbers of your cards.but will not affect the normal use. Two fixed buttons and two opened snap buttons guarantee the security of the card. If you have any questions,please feel free to contact us,we are pleased and will offer you the best solution.your satisfaction is our ultimate goal. 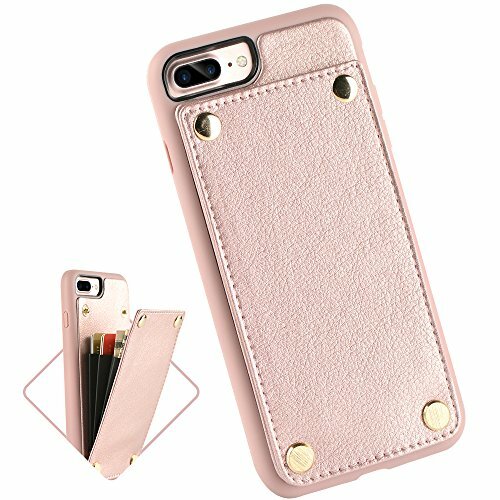 Package: 1x LAMEEKU Wallet case for iPhone 7 PLUS/8 Plus 5.5inches display. 【18 Months Warranty-100% SATISFACTION LAMEEKU BRAND GUARANTEE!】: LAMEEKU customer team would endeavor to win 100% customer satisfaction.If you meet any question, please contact us, we will fix your issue within 12 hours. If you have any questions about this product by LAMEEKU, contact us by completing and submitting the form below. If you are looking for a specif part number, please include it with your message.